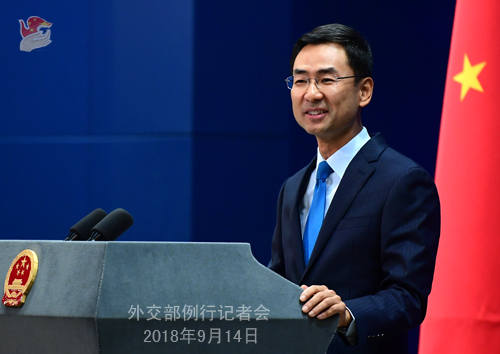 At the invitation of the Russian government, member of the Standing Committee of the Political Bureau of the Central Committee of the Communist Party of China (CPC) and Vice Premier of the State Council Han Zheng will visit Russia on September 16-18. He will co-chair the fifth meeting of the China-Russia Investment Cooperation Committee with First Deputy Prime Minister Anton Siluanov, and the 15th meeting of the China-Russia Energy Cooperation Committee with Deputy Prime Minister Dmitry Kozak. At the invitation of Deputy Prime Minister of Singapore Teo Chee Hean, Vice Premier Han Zheng will visit Singapore on September 19-21. He will co-chair with Deputy Prime Minister Teo Chee Hean the 14th China-Singapore Joint Council for Bilateral Cooperation Meeting, the 19th China-Singapore Suzhou Industrial Park Joint Steering Council Meeting, the 10th China-Singapore Tianjin Eco-City Joint Steering Council Meeting, and the 2nd China-Singapore (Chongqing) Demonstration Initiative on Strategic Connectivity Joint Steering Council Meeting. Q: Can you tell us when President Xi Jinping will be meeting with the Venezuelan President? Would it be today or tomorrow? A: What I know is that they will meet this afternoon. Q: Could you talk more about Vice Premier Han Zheng's visits to Russia and Singapore and the bilateral cooperation meetings he will co-chair? How does China comment on the current China-Russia and China-Singapore relations? A: At present, the China-Russia comprehensive strategic partnership of coordination is at its best level, and pragmatic cooperation in the investment and energy fields has continued to advance. A few days ago, President Xi Jinping and President Putin held their third meeting in this year in Vladivostok and reached important consensus on promoting pragmatic cooperation in various fields under the new circumstances. Investment and energy cooperation is an important part of China-Russia pragmatic cooperation. During his visit to Russia, Vice Premier Han Zheng will hold the fifth meeting of the China-Russia Investment Cooperation Committee with First Deputy Prime Minister Anton Siluanov, and the 15th meeting of the China-Russia Energy Cooperation Committee with Deputy Prime Minister Dmitry Kozak. These meetings will be held for the first time after new governments were elected in our two countries and new chairmen were selected for these two committees. The two sides will review cooperation results in the fields of investment and energy, focus on exchanging views on the implementation of the consensus between the two heads of state, explore measures for deepening cooperation, compare notes on the progress of major cooperation projects, and lay the groundwork for other important meetings between the heads of state and prime ministers of the two countries in this year. Singapore is China's friendly neighbor. The two countries have established an all-round cooperative partnership marching with the times and carried out fruitful cooperation under the framework of the Belt and Road Initiative. Vice Premier Han Zheng's visit is aimed at implementing the important consensus reached by the two leaders, strengthening strategic communication and deepening pragmatic cooperation. During the visit, Vice Premier Han Zheng will meet with Singaporean President Halima, Prime Minister Lee Hsien Loong, Deputy Prime Minister Teo Chee Hean and Deputy Prime Minister Tharman Shanmugaratnam. The two sides will focus on exchanging views on China-Singapore relations, the Belt and Road Initiative cooperation and other international and regional issues of common concern. The bilateral cooperation mechanisms between China and Singapore at the vice prime ministerial-level include the Joint Council for Bilateral Cooperation Meeting, the Suzhou Industrial Park Joint Steering Council Meeting, the Tianjin Eco-City Joint Steering Council Meeting, and the (Chongqing) Demonstration Initiative on Strategic Connectivity Joint Steering Council Meeting. These are the highest-level institutional communication channels between the two sides which have played an important role in deepening mutually beneficial cooperation and driving economic and social development of the two countries. Q: The Venezuelan delegation met with the Chinese side in Diaoyutai Guesthouse this morning. Can you tell us any information about these meetings? A: President Maduro is on a state visit in China. President Xi Jinping will hold talks with President Maduro. Premier Li Keqiang and Chairman Li Zhanshu will meet with President Maduro on separate occasions. We will release relevant information in due course. Q: According to reports, recently a Philippine fisherman was missing in waters off the Nansha Islands. The Chinese side has arranged for search and rescue operations. Do you have more details? 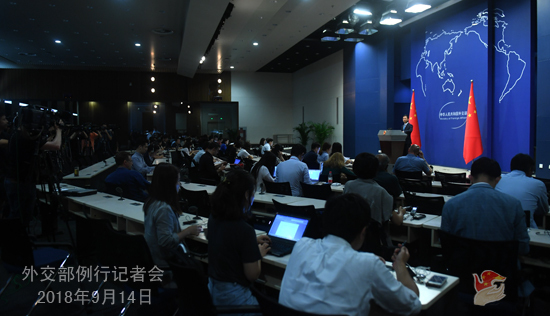 A: We have been informed by the Philippine side that on the afternoon of September 13, a Philippine fisherman fell into water and went missing in waters south to the Commodore Reef in the Nansha Islands. At the request of the Philippine side, China immediately dispatched vessels nearby to that area. The search and rescue efforts are still underway. Q: The US Treasury Department has put sanctions on a Chinese-based tech company based in Yanbian, Jilin province due to its relationship with the DPRK. Has the Chinese government complained to the US government about these sanctions? A: China has fully and strictly implemented DPRK-related resolutions of the UN Security Council. At the same time, we oppose any country using unilateral sanctions or imposing "long-arm jurisdictions" on Chinese entities or individuals in accordance with its domestic laws. China has lodged stern representations with the US, urging the US side to stop its wrong action. Q: There is a correspondent of ours who has been traveling along the Mekong River doing a story about the development there. It is said that the Chinese side has blasted the river to expand it to allow commercial vessels to travel through. Some are welcoming this, but fishermen and conservationists are concerned about it and they perceive the efforts there as part of the one Belt and one Road strategy to control the global economy. Do you have any comment? Geng Shuang: Where did your correspondent travel to? Journalist: The border areas of Thailand. Geng Shuang: Who is doing the construction there at this point? The Chinese side or the Thai side? A: I'm not aware of the specific situation you mentioned and have to check on that. China participates in the Lancang-Mekong cooperation (LMC) as actively as always. In recent years, the LMC initiated by China has achieved rapid development, reaped a series of positive outcomes and been positively responded and echoed by all countries in the Lancang-Mekong area. These outcomes have gradually brought benefits to people of countries in the Lancang-Mekong region. As to other consequences the blasting may have caused you mentioned, China and other countries in the Lancang-Mekong region always pay attention to prior environmental assessment and protecting local environment when carrying out relevant projects. In addition, any project won't be conducted without the consent of both China and the relevant country concerned. 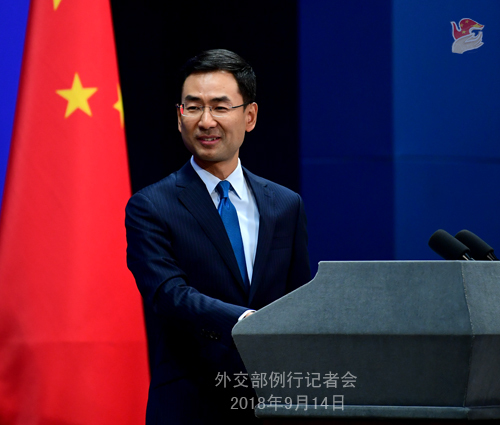 Regarding the Belt and Road Initiative you mentioned, as a resident correspondent you must know it very well that it is an initiative for economic cooperation which follows the principle of consultation, cooperation and benefit for all and the spirit of openness, inclusiveness and transparency. It always pursues high quality, high standard, sustainability and environmental protection. We all bear witness to the positive outcomes and achievements of the initiative since its inception five years ago. I will share with you one single example here. Up to now, over 130 countries and international organizations have signed MOUs on the cooperation under the Belt and Road with China, which does speak volume to this issue. As we have been stressing, all like-minded countries can be part of the Belt and Road, and we remain open towards and welcome their participation. Q: Who will lead Chinese delegation to the UN General Assembly and make a speech? A: I suggest you wait another couple of days. We will release relevant information in due course. Q: According to reports, the US recently said that China has more to lose and is under greater pressure than the US in a trade war. China's economy looks bad and its business and investment are "collapsing". What's your comment? A: China's position on the issue of China-US trade disputes is clear and consistent. As we stressed many times, trade war never resolves any problem and will only hurt the US itself and others. As a Chinese saying goes, "Kill one thousand enemies, lose eight hundred soldiers." I believe there is no point arguing the difference between one thousand and eight hundred. I believe you may have noted that, in public hearings on the proposed tariff increase on $200 billion of Chinese imports, most attendees believed that the tariff increase would harm US enterprises and even destroy relevant industries. The US Chamber of Commerce said in written testimony that the new tariffs would dramatically expand the harm to American consumers, workers, businesses, and the economy. In more than 1,400 written comments submitted to the Office of the United States Trade Representative, most businesses argued that new tariffs on $200 billion of Chinese imports will force Americans to pay more for items they use throughout their daily lives, from cradles to coffins. According to a report issued by the American Chambers of Commerce in China and in Shanghai just yesterday, two-thirds of American companies in China say their business in China have been affected by the first round of tariffs the US imposed on $50 billion worth of Chinese goods. Over 70% of US businesses in China said they would be hurt if Washington's tariff on $200 billion of Chinese goods goes ahead. The US government's tariffs will turn out to be just the opposite of their wish. We again urge the US policymakers to heed the strong call of its industries and customers and the appeal for multilateralism and free trade from the international community. It needs to come back to its sense as soon as possible and stop unilateral and trade protectionist practices. As to China's economy, according to latest statistics, the GDP grew at a rate of 6.8 percent in the first half of this year. The total imports and exports from January to August registered a year-on-year increase of 9.1 %. The number of foreign-invested businesses newly set up rose by 102.7%. Despite uncertainties and destabilizing factors from the outside, the general trend of steady growth for the Chinese economy remains unchanged. The Chinese government is confident in and capable of ensuring the steady and sound development of the economy. To sum up, like what my colleague from the Ministry of Commerce and I said yesterday, the Chinese side has received the US' invitation for a new round of trade talks and we welcome that. A spiraling trade war is in the interests of neither side, and dialogue and consultation on the basis of equality and good faith make the only viable way out for the problem.